Scottish Plaids, Do You Wear One? Scottish plaids come in three varieties, the fly plaid, the drummer's plaid and the full piper's plaid. The word plaid has become synonymous in America with the word tartan. So I want to make it quite clear that this page is about the three varieties of plaids, and not about tartan. The ironic thing of course is, that Scottish plaids are made from tartan cloth, the tartan of the plaid always matches the tartan of the kilt. The word plaid comes from Gaelic and literally means blanket. So why is it worn with Highland Dress, and what purpose does it serve? The major reason, is that the plaid is a symbolic representation of the upper part of the great kilt, the Feileadh mhor, and it is decorative. The most widely worn of the three Scottish plaids, is by far the fly plaid. It is a square piece of fringed tartan cloth, as I said the same tartan as the kilt, measuring approx forty inches by forty inches. It is worn over the left shoulder, with one end passed under the epaulet, and fastened with a broach at chest height. It should only be worn to formal occasions, such as black tie events, formal dinners, etc, although it is increasingly being worn by the groom and groomsmen at weddings. Below you can see a photo of a fly plaid being worn. A fly plaid should not be worn as day wear, as this is totally inappropriate. The pipers plaid would not be worn by anyone other than a piper. It is a much bigger plaid than the fly plaid, usually between three and five yards long, and does not simply hang down at the back, it is worn around the waist and has pleats stitched in where it passes across the chest. This plaid is also fringed, and pinned to keep it secure while the piper marches. 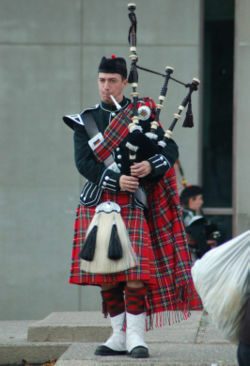 Below you can see a photo of a piper wearing the piper's plaid. As you can see from the photo, the pipers plaid is far more elaborate than the fly plaid. 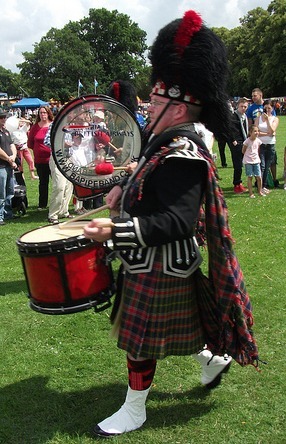 The drummer's plaid, sometimes known and referred to as the half plaid, is said to be a smaller version of the Piper's plaid. 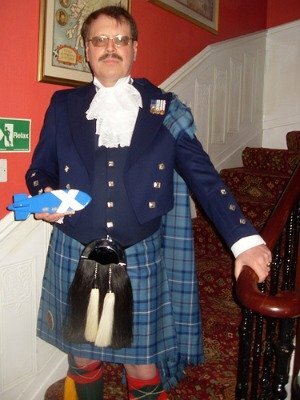 As you can see from the photo above it is indeed much smaller than the piper's plaid, and much simpler to put on. It does not go across the chest, and is cut and stitched differently. One end is fastened around the waist, while the other end goes through the left shoulder epaulet, and is secured by a plaid brooch. If you would like any further information on the different plaids, then simply drop me a line using the contact us page, and I will be happy to answer any questions you may have.